Tomorrow is our Feed the Need Packing Party, and we are so excited to help more teenagers through the meals packed and funds raised through this fundraiser. As we prepare for this fundraiser, I can’t help but think of the faces and stories of teenagers that I get to work with on a weekly basis. Their pain is real. Their success changes lives. Their questions are relevant. Their stories change my perspective. I can learn more about a teen in a one-hour Support Group meeting than many people can find out over months. Empathy makes all the difference in the world. In these Support Groups, we are not asking questions because we want to be nosy, tell them what they are doing wrong, or even fix their lives. We ask questions because we want to step into life with them, even when it’s hard and there is no easy fix in sight. I absolutely love the Brené Brown video below. She expertly describes the difference between empathy and sympathy while revealing the power of showing true empathy in difficult circumstances. 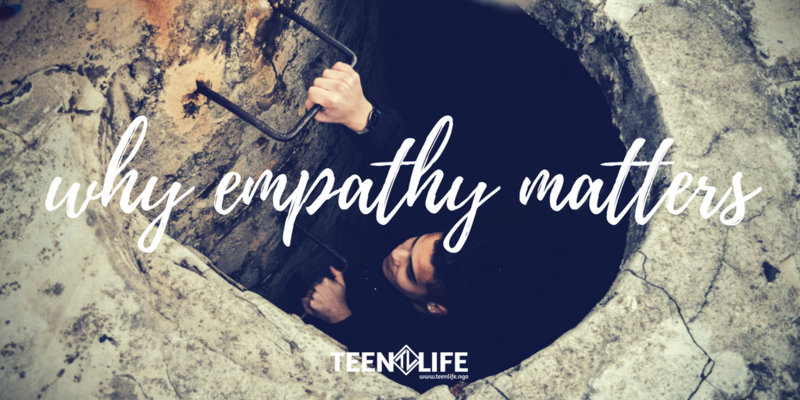 When you watch the video, you can see that empathy is a powerful tool, especially when dealing with teenagers. Broken home lives where they are forced to choose who they want to live with. Families who encourage drug use while they are trying to stay clean. Fathers who bring their mistress into the home while mom tries to keep the family together. 30-hour work weeks to help the family pay medical bills. A fear of graduation because that is when they will be kicked out of their house. Extreme racism and name calling in a work environment. Do I have the answers to these problems? Can I come up with magic words to make the hurt go away? But I can listen. I can tell them that I am so sorry they are having to deal with such difficult life circumstances. I can sit in a chair beside them and step into their world for an hour a week. I can give them a safe, judgement-free zone to talk about their lives and problems. I encourage you to try some of the tactics mentioned in the video and to avoid phrases like “at least.” Step into a teenager’s shoes, crawl down into the pit with them, and show that someone cares and wants to listen. In order for us to continue to provide these Support Groups and show empathy, we have our annual fundraiser. And so I also encourage you to get involved with our fundraiser! You can donate, pray, volunteer or simply share our fundraising page with friends to raise more awareness and help us reach our goal. It is not too late to make a difference in the lives of teenagers – join us!